Carl Harry Stålhane was a prominent Swedish ceramist of international acclaim for the unique hand built stoneware and industrial tableware that he produced throughout the 20th century. Stålhane enjoyed a 40 year career at Rörstrand Potteries, and established his own workshop, Designhuset, where he created experimental ceramics from 1973 onwards. Stålhane was born in Mariestad, Sweden in 1920. He was in the employ of Rörstrand from the age of 19 as a painter of ceramic works, taking a brief hiatus in from 1943-1946 and again from 1947-1948 to study painting and sculpture at the Art School of Grünewald in Stockholm and at the Académie Collarossi in Paris. Stålhane initially worked under the supervision of expressionist painter Isaac Grünewald, and later the two artists worked in collaboration. Their collaborative efforts were so successful that Stålhane and Grünewald were invited to exhibit their ceramics at the Swedish National Museum. By the age of 30, Stålhane was a master ceramist, and in 1953 he was appointed art director and chief designer for Rörstrand, succeeding important mid-century ceramist Gunnar Nylund. Stålhane's earlier works are characterized by elegant and slender, symmetrical forms in monochrome or matte glazes in a style that embraced Chinese Sung ceramic art traditions. 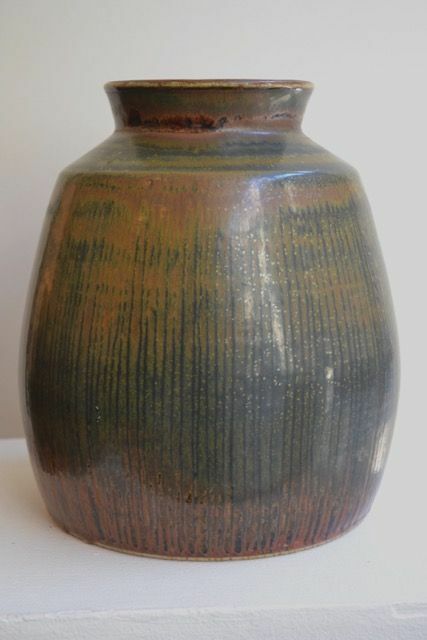 In the 1960s, Stålhane's body of work consisted of heavier, rough-hewn works of impressive scale with thickly poured glazes, resultant of his experimentations with different local clays, colors and glazing techniques. Throughout his career, Stålhane relied heavily on drawing in order draft the overall design for his forms. Stålhane personally executed all of his unique hand built forms, and applied all of decorative motifs by hand. In 1973, Stålhane left Rörstrand to open his own studio, Designhuset, alongside master thrower Kent Ericsson. During this time, he continued to work with ceramics, however he returned to Chinese and Japanese traditions.